Texas A&M University is a public university in College Station, Texas. It is a large university, with about 65,000 students. It was founded in 1871. 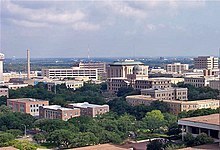 It and the University of Texas at Austin are the two largest universities in the state. For many years, everybody at Texas A&M had to take classes about the army, and Texas A&M is one of only six schools in the country that have a "Corps of Cadets." The George H.W. Bush presidential library is at Texas A&M. There are other campuses of Texas A&M in Galveston, Laredo, Corpus Christi and Texarkana. There is also a campus in Qatar. Texas A&M's athletics teams are called the Aggies. Texas A&M has 18 varsity teams that compete in the Southeastern Conference. This page was last changed on 21 March 2018, at 07:34.